May 16, 2018, 5:30 p.m. The latest economic good news – the lowest jobless rate in nearly two decades – brings with it public recognition of economic improvement. More than one in three in the latest Economist/YouGov Poll know the jobless rate is below 5%. Only one in four put it above 6%, down from 42% in 2016. But that knowledge has taken Americans a long time to absorb. 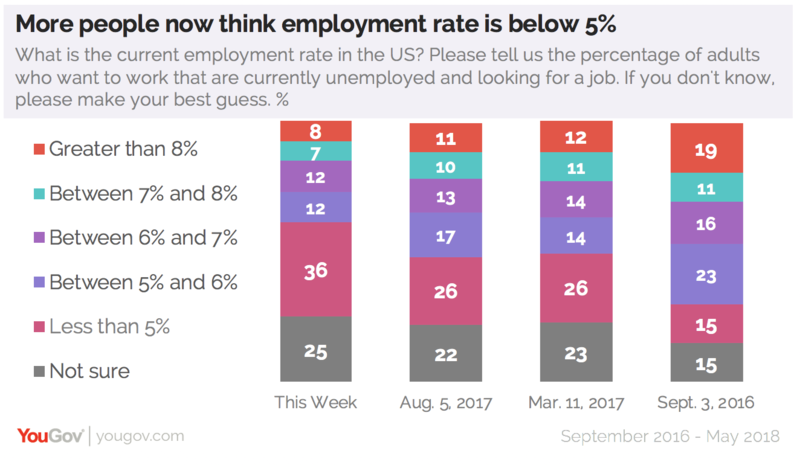 Even today, after nearly two and a half years of jobless rates at or below 5%, 25% say they don’t know what the unemployment rate is. A majority of Republicans (53%) correctly cite the current unemployment rate, up from just 12% in 2016. Democrats recognize the improvement too, but to a lesser degree. In 2016, 15% of Democrats put the rate below 5%. Today, 31% do. This isn’t really a surprise. And it’s also not an indication of who is paying attention. 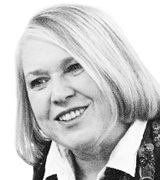 Economic gains are often seen through partisan lenses. The jobless rate just dropped to 3.9% from 4.1%, where it had been for six straight months. And more than a third of the public recognize this. But there remain large party differences: a majority of Republicans know the rate declined. Less than a third of Democrats do. During the Obama Administration, Republicans often saw the jobless rate as worse than it was. In September 2016, as the jobless rate bounced between 4.9% and 5.0%, well below the 7.8% registered for January 2009 (at the start of the Obama Presidency), 59% of Democrats but just 30% of Republicans recognized that the unemployment rate had dropped since 2009. More Republicans (36%) said it had gone up and not down during that time. The long decline in the jobless rate has made the public a little less worried about the issue, though it still matters. 63% say the economy is a very important issue to them, putting it behind only health care, which 70% say is very important. And more than half say it is a serious problem for the country, though just 19% say it is “very serious.” That is a drop from last summer, and a steep decline from what it was before the 2016 election. Only a third today classify unemployment as a serious problem in their own communities, a large drop in the last two years. Over the last several years, more Americans have seen the economy improving – or at least not getting worse. That evaluation has continued to move in a positive direction. In this week’s poll, 33% overall see the economy as getting better, and just 20% say it is getting worse. And the President’s approval rating on handling the economy is the highest of all the domestic issues asked about in the poll, and outpaces his overall approval rating, which dropped back to 39% this week, down from last week’s bump up to 42%. This week, half disapprove. These more positive assessments may in part come from a sense that the news media are reporting better economic news. About twice as many today say the news media mostly reports positive economic news as say that most economic news has been negative. That is a large change from September 2016, when nearly three times as many adults thought economic news reporting was mostly negative as opposed to mostly positive. But even today, one in three see an equal mix of positive and negative economic news. And many aren’t sure the unemployment rate is really a good indicator of the health of the economy. 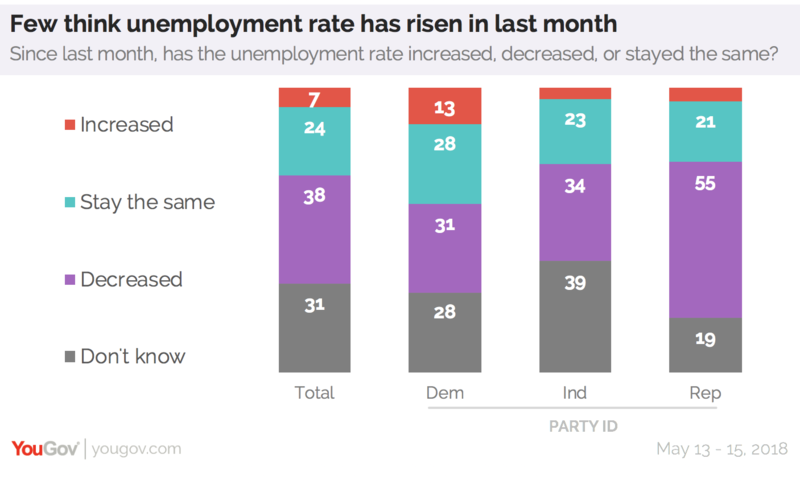 But more Republicans than Democrats see the unemployment rate’s value. What is the best indicator? 41% of Republicans and 31% overall cite the jobless rate, but one in four overall think it’s the price of goods, and 15% say their own family’s economic situation is the best measure. Only 6% choose the stock market. But one in four didn’t choose any measure – the same percentage that did not answer the question about the current unemployment rate.